What’s the first thing that comes to mind when you hear the name Hyundai? Probably cars, right? After all, the Seoul automaker, along with Kia, is ranked number five in the world based on 2012 sales. But what you may not know, and frankly we didn’t either, is that Hyundai is actually looking to get in on the Android décor. And not just with an app that allows you to remotely start your vehicle, lock and unlock it, but also with a crazy affordable 7-inch tablet. The T7 is already up for grabs via PandaWill for a mere $165.99. That’s 35 bucks less than the 8 GB Nexus 7 and basically right on-par with the cheapest Kindle Fire 7 (with “special offers”). Not too special, you say? 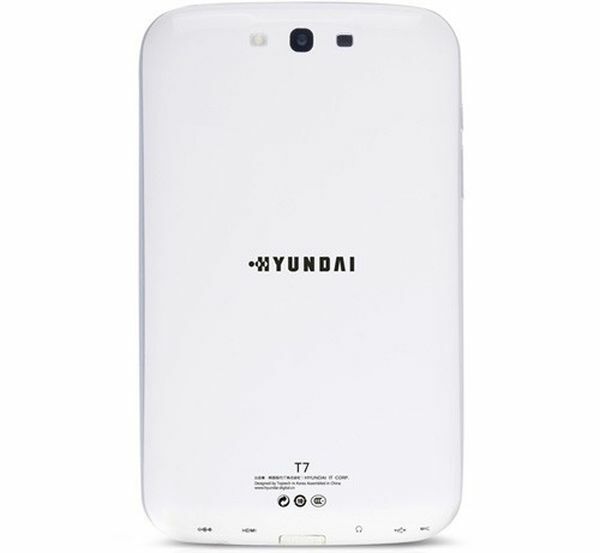 You’re probably right, but get this – the Hyundai T7 is powered by a quad-core Samsung Exynos 4412 CPU. That’s the same blazingly fast processor that’s inside the Samsung Galaxy S3, and, if we’re not mistaken, it pretty much shatters Nexus 7’s Tegra 3, not to mention Kindle Fire’s poor old dual-core TI OMAP 4430. Oh, now I have your curiosity? Good, because the Hyundai T7 also sports a more than decent IPS LCD capacitive touchscreen with 1,280 x 800 pixels resolution. And 1 GB of RAM. And dual cameras, and Wi-Fi 802.11 b/g/n, and Bluetooth, and G-sensor, and GPS. And even a micro-HDMI port. It really sounds too good to be true, doesn’t it? Well, not all is milk and honey for the T7, so a few of the downsides seem to be the 8 GB of on-board storage (without any kind of SD expansion possibility albeit with microSD support), the 3,300 mAh battery supposedly capable of five hours of autonomy (so more like three in real life), and the running of Android 4.0 Ice Cream Sandwich. The cameras are far from perfect themselves (just 2 MP on the back and 0.3 MP on the front), but they’re both there and that’s more than we can say about the Nexus 7 or Kindle Fire. As for the design, that’s not really a downside, but it’s not an upside either. The Hyundai T7 is lighter than its competitors, at 303 grams, but a tad thicker than the Nexus 7 (10.9 mm vs 10.5). Meanwhile, we don’t expect the build quality to be too great, as there seems to be plastic everywhere. In conclusion, should you buy this Hyundai tab? Probably not, but not because of any of those specs. Instead, what concerns us is the very likely lack of interest Hyundai has for the mobile world. Of course, if you’re willing to take the risk of scoring a clunky and cheap-feeling gadget, the deal looks pretty good, so your call.